I dont want to tell her story for her, but I do want to express how proud I am of her for giving her family an example worthy of following! Keep up the amazing work Joslyn! Check out her results here! I am 28 years old, a wife and a mom of 4 kids! Our oldest is 6 and our youngest is 9 months old! Growing up, I never ate healthy. In high school, I played Varsity Volleyball and was really active. But with practices and games, tournaments, school work…I lived off of fast food and soda. Since I was young, my metabolism helped and my body didn’t seem to mind too much. But once I graduated and started college, I started to put the freshman 15 on! My husband and I got married the day after I turned 20…that was the heaviest I ever weighed, other than during my pregnancies. We got pregnant with our first daughter in 2006 and she was born in 2007. I had really bad postpartum depression after she was born. I was eating horrible, not exercising and just making poor food choices on a daily basis. And on top of that, the medication I was put on for my depression caused me to gain more weight. I got pregnant with my 2nd daughter in 2008 and started off that pregnancy at 165 pounds. After I delivered her, I was a size 14 and 170 pounds. We lost our home, continued to eat poorly and 10 months later we found out we were expecting our 3rd! I had a big wake up call one night when I was about 8 months pregnant. We had eaten fast food for probably the 4th or 5th time in one week and our oldest daughter had another upset stomach. I decided enough was enough! I had purchased P90X back in 2007, but never used it. It sat collecting dust for 3 years! After our son was born in 2010, I started P90X and never looked back! I lost 60 pounds and went from a size 14 to a size 6. Since completing P90X, I also did Insanity. In 2012, we had the biggest surprise of our life and found out baby #4 was coming! 4 babies in 6 years!! But because I knew and believed in P90X, I bounced right back after he was born! 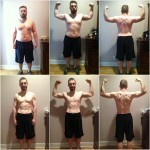 I’m now on to P90X2 and loving this journey! I never thought I could be in this kind of shape! Every day I have a choice to be healthy and to make good choices. I want my kids to look up to me and I want to be an example to them. I love that together, we get to be a fit and healthy family! I’m so thankful God showed me Beachbody and their products! P90X changed my life!! There’s so many days I have excuses why I can’t work out or don’t feel like it. But every day I overcome those excuses and push myself so I can be the best me I can be! One of the KEY factors in getting results like Joslyn did is having someone who has gone before you and gotten the results that you want. Then it becomes as simple as monkey see monkey do. If you want the same results as someone else…do what they did. It really is that simple! Thats why I want you to make me your free coach right now. If you REALLY want the results…then lock arms with our team and let me show you how to do it. You will get one-on-one support, motivation, tips, and advice from me (Coach Todd) personally! On top of that, you get the support of our entire RIPPEDCLUB crew! Lets make it happen!